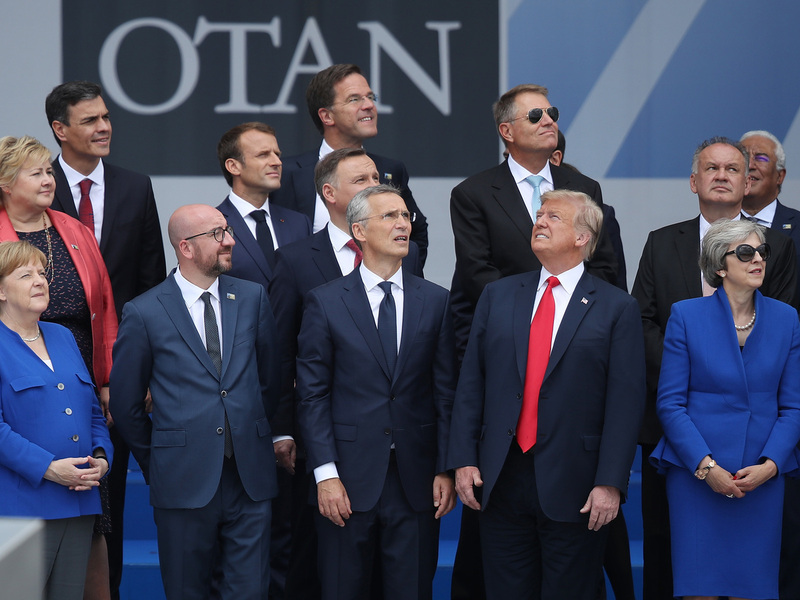 Opinion: The Problem With Trump's Wrecking Ball Approach To NATO The U.S. president publicly humiliated our most important allies and then said everything was great. We need positive, unifying leadership, writes a former U.S. Army Europe commander. German Chancellor Angela Merkel (front left), Belgian Prime Minister Charles Michel, NATO Secretary-General Jens Stoltenberg, President Trump and British Prime Minister Theresa May attend the opening ceremony at the NATO summit Tuesday in Brussels. Retired Lt. Gen. Ben Hodges was commanding general of NATO's Allied Land Command from August 2012 to November 2014 and then commanding general of the U.S. Army Europe from November 2014 until December 2017. He now works for the Center for European Policy Analysis as its Pershing chair in strategic studies and as a partner in Berlin Global Advisors. He is based in Europe and continues to focus on America's alliances and on educating citizens and policymakers on both sides of the Atlantic. I left Brussels Thursday afternoon with mixed emotions. First, it was important to see the substance of what the North Atlantic Treaty Organization has accomplished as of the summit this week, since the historic NATO summit in Warsaw just two years ago. The achievements include the adaptation of the NATO command structure, which will significantly improve the reinforcement and responsiveness capabilities of the alliance. Members have also renewed commitment to increased defense expenditures and investment and made progress on improving military mobility, as well as beginning the process toward Macedonia's eventual membership. NATO Secretary-General Jens Stoltenberg has done a superb job of shepherding the members, keeping all on track and building momentum toward real substance. We are lucky to have him. But second, I was disappointed to see President Trump bring a wrecking ball to Brussels. He publicly humiliated our most important allies and then, the following day, said everything was great, that he had a great relationship with the chancellor of Germany and that he was personally responsible for the money that was "pouring into NATO." The mood around Brussels was a mix of concern, worry, frustration, anger and resentment toward our president — not exactly what one would expect or hope for in the case of the leader of the free world. There is a growing recognition that the president either doesn't understand the concept of an alliance and allies or he doesn't care. Either way, it is in the worst interest of the United States — and the best interest of the president of Russia — that there is so much turmoil, confusion and frustration inside the most successful alliance in the history of the world. The nature of coalitions and alliances is that there will always be friction and competing agendas and priorities, but they tend to stay together as long as there is a unifying theme or threat and/or shared common values and interests. 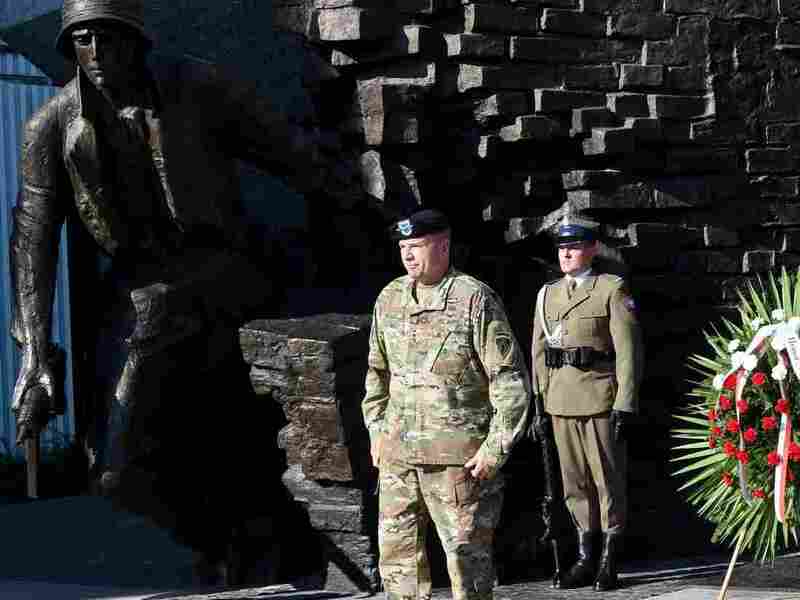 Lt. Gen. Ben Hodges, then the Army commander in Europe, stands after laying a wreath at the Warsaw Uprising Monument in Warsaw, Poland, on the eve of Armed Forces Day in August 2017. The U.S. Army Europe opened new headquarters in Poland in May 2017. NATO is no exception and has surely gone through some tough patches. Yet American leadership has always helped keep the alliance together, because every president has realized that it is in our own best interest that Europe be secure and stable and that NATO continue to thrive and adapt. First, the economic relationship between North America and the European Union is vital considering the size of our respective economies and volume of trade between them. The European Union is the United States' largest goods trade partner. Our own prosperity is linked directly to security and stability in Europe. Second, the United States no longer has the capacity or capability to carry out extended military operations, such as in Afghanistan, on our own. We need allies. And all of our most reliable, effective allies come from Europe, plus Canada and Australia. Finally, Europe gives us access to half the world. All that the U.S. does in Africa and much of the Middle East and Eurasia is because of our bases and relationships and linkages in Europe. The U.S. Africom headquarters is in Stuttgart, Germany. The Ramstein Air Base in Germany is a major hub for transport aircraft that do missions in Africa, Europe and the Middle East. And the Incirlik Air Base in NATO member Turkey is essential to our operations in Syria and Iraq. Whatever happened to positive, unifying leadership by the president of the United States? The president is completely wrong when he complains about the U.S. troops in Europe who are protecting Germany. They are not there to protect Germany; they're there as part of our contribution to collective security. The Ramstein Air Base is an unsinkable aircraft carrier that allows us to fly in three different continents. Without the access we have in Europe, we cannot carry out our national security strategy. Germany is our essential ally: We need Germany to be a part of everything that is important to us because the German brand is so respected around the world. Sure, they can and should do more, and in fact they are already improving. But it's time to think strategically, instead of transactionally, and ensure that we have an alliance that is united and capable and not one that's wondering whether the United States will live up to its obligations. Whatever happened to positive, unifying leadership by the president of the United States? It has long been the trademark of American presidents — indeed, of America. It's time to bring that back.